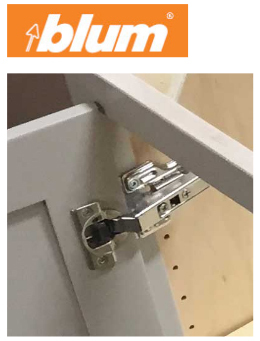 The product you have purchased includes Blum lift systems, concealed hinges and/or drawer runners, the finest in functional hardware. In keeping with our commitment to quality, integrity, and expert workmanship, this hardware meets or exceeds the highest industry standard requirements. We can include soft close on all door and drawers to eliminate the noise and reduce the wear that comes with repeated slamming. The new generation of slides and hinges are not your grandmother’s slides and hinges. To handle the shifting that is inevitable with years of moister changes and heavy usage, blum slides can be adjusted in multiple directions and angles so they fit and look as nice 20 years from now as the day they were installed.